Are you looking for good, quality mitten and glove for your family this winter? I know we were! My poor daughter and husband were using thin, pretty much useless gloves while playing outside and there poor hands were FREEZING! NOT ANYMORE!!!! SnowStoppers is a company that makes children's mittens and gloves with an extended cuff to prevent snow from getting into the coat. My 2 year old daughter is absolutely LOVING her SnowStoppers Nylon Mittens! She wears them every time she goes outside in the snow and NEVER gets snow up her arms or down her mittens! These Nylon Mittens feature the Patented SnowStoppers® Sleeve, Waterproof Liner and Thinsulate™Insulation. The Nylon Outer Shell resists snow, ice and water better than fleece. The SnowStoppers® Extra-Long Cuff STOPS the SNOW from getting between the coat and mitten and they Don't Fall Off! The Tough Grip palm makes them great for Skiing, Sledding and Snowboarding—making a Snowman, too! Waterproof Drypel Lining prevents snow or water from penetrating the mitten, while allowing moisture to escape from the hand cavity. Thinsulate™ 40 Gram Insulation provides warmth without bulk. 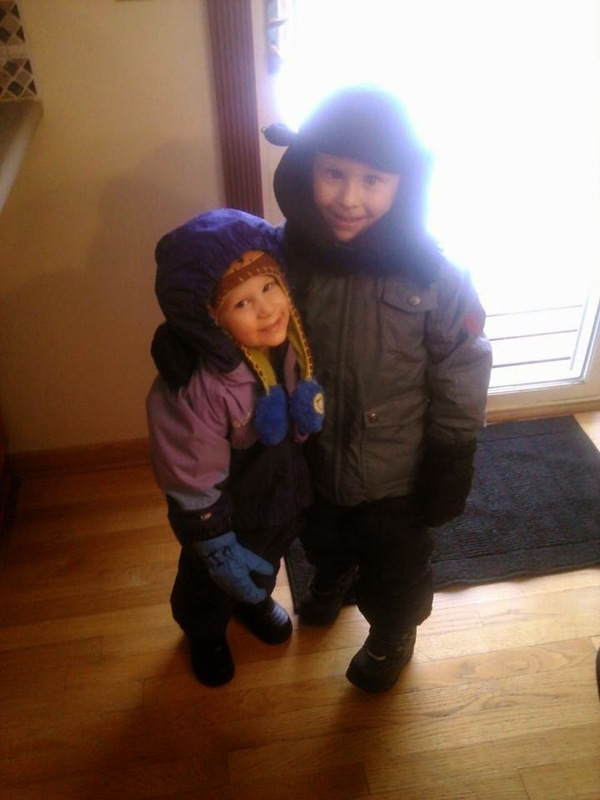 You can see the blue SnowStoppers mittens on my daughter on the left! Kids stay warmer and play longer with SnowStoppers® Mittens. Don't you wish you had these mittens when you were a kid? Have you ever needed to do something while you had your mittens on but your mittens made your hands too clumsy? That will never happen again with the eMitt. You need these Convertible Flip-top Mittens for Adults from SnowStoppers®. And they now have Touchscreen Compatible Fingertips and Grippy Dots! These mittens let you use your phone and do the other things you need to do without having to take them off. The eMitt is a nice warm mitten with a lightweight glove liner material that covers your fingers when you flip them open and a spandex flap to cover the finger opening so snow doesn't get in. The touchscreen compatible fingertips and “grippy dots” enable you to easily use your phone, adjust your bindings, zip a zipper, use a camera or do just about anything while wearing the eMitt! Tough and versatile. This is the only Flip-top Mitten with the Patented SnowStoppers® Extra-Long Cuff that Stops the Snow from getting to the wrists between the coat and mitten. Zippered pocket holds a hand warmer, cash, keys, or whatever! Great for all sorts of activities including Skiing, Snowboarding, Hunting or just Walking the Dog. My husband LOVES his eMitt and wears them whenever he needs to keep his hands warm (which is like everyday here in Minnesota!). He loves that he can use the water resistant outer shell for playing in the snow, but he can switch to the Sure Grip fingers when he drives, talks on the phone or needs to grip things! You can purchase all SnowStoppers mittens from the Veranda Outdoors website. (2) pairs of children's mittens, 2 children's fleece jackets and 2 pairs of eMitts to a lucky winner!